We are a private foundation that assists the most vulnerable homeless people that live on the streets of Barcelona. We accompany them to get a life as autonomous as possible covering the basic needs, providing housing and social and health attention. At the same time, we do tasks of social awareness about poverty problems in our environment, we report unfair situations to administrations and to the citizens. We have an Open Centre at c/Riereta, Barcelona. It is a free access space that works in the morning (from Monday to Friday) and in the afternoon (from Monday to Saturday) to offer orientation to homeless people about the resources the city has and also about the shower, cloakroom, wardrobe and pharmacological activity services. But, above all, we listen and we accompany people. We also manage the Pere Barnés home, an equipment of temporary stay to homeless people with a delicate health status. And La Troballa, our workshop. We have a street team that goes around the city visiting the most vulnerable people that sleep on the street and giving them answers to their needs such as go to a doctor or look for housing. We also manage two low requirement night spaces for people we know and that haven’t found anything at the other city resources. What areas do the Arrels’ street team travel around? Arrels’ street team has a limited capacity of action and it cannot cover all the city of Barcelona. 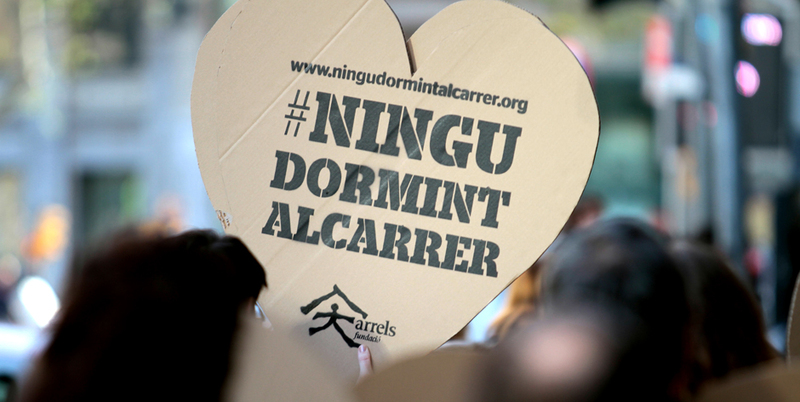 Specifically, we visit the most vulnerable homeless people in six areas of the city: Eixample, Ciutat Vella, Sants-Montjuïc, Gràcia, Sant Martí and Sant Andreu. They also visit some people in situations of serious exclusion in the rest of the constituencies. How many people have we assisted? Since Arrels’ establishment in 1987, we have assisted more than 13,000 homeless people and the figure do not stop growing up. Only in 2018, we have assisted 2,368 people, one thousand of them for the first time (89% are men and 11% are women). Throughout 2018, we have visited 528 homeless people, we have taken in 1,963 people in the Open Centre and we have guaranteed housing to 239 people. How many people have rebuilt their lives after being at Arrels? Getting back the previous life is practically impossible because its foundations are broken. They try to recover their maximum autonomy through a complex work of a personal and life reconstruction that takes a lot of years. One of the main problems that we have to face up to get this goal is the age of the assisted people: most of them are over 50. In what do Arrels invest the money and where does it come from? We obtain 41.04% of the budget from the membership fee and occasional donors that support Arrels’ work. We also obtain it from local and autonomous administrations (33.96%), from companies (6.51%) and collaborator foundations (2.69%) and from donations of the residents themselves. 78% of our budget allocates to direct attention, 9.98% to awareness and impact and the rest (11.98%) to guarantee the structure of the entity and the coordination of the voluntary work team. How many people work at Arrels? At Arrels, we are currently near 400 volunteers and 64 workers. 80% of the volunteers go into the direct attention while the rest divided the tasks of awareness and incidents and internal structure among themselves. In terms of the working team, 44 coordinate the work of direct attention, 14 work at tasks of structure and 6 in social and political awareness and incidence. Is there a minimum fee to be an Arrels member? There is no minimum fee to be an Arrels member. The donation can be monthly, quarterly or annually. Also, all the occasional donations as well as the periodic payments, are deducted in finance because we are a foundation. Apart from the donations and fees, you can also get involved handing over a flat, offering clothes and furnitures according to the needs or making Arrels heiress, coheiress or legatee of your patrimony. Our future goals are to rehabilitate the Arrel’s Pere Barnés home to expand the lodging places; open a new low requirement space that offer solutions to homeless people who have lived on the street for a long time; improve the orientation and advice service about what to do when someone sleep on the street and keep sensitizing to break prejudices and change the glance towards homeless people. What requirements that are necessary to make voluntary work at Arrels? To do voluntary work at Arrels it is not necessary to have a specific formation but we do ask for a person to be over 22 and that can commit in a stable way once a week. Do voluntary work at Arrels means to get close to the reality of homeless people in Barcelona. You can consult the voluntary needs that we currently have and volunteer to some of them filling up the form or writing down to voluntariat@arrelsfundacio.org. By email, we will give you more details so you can value if the voluntary work is adapted to your availability. Depending on your answer, we will meet to have a small talk and get to know each other. If you finally join us, Arrels will offer you an initial formation about the functioning of the entity and the reality of homeless people. How many hours a week do you need to devote? We ask for a minimum of 2 hours a week. If your voluntary work is a project with direct contact with the people we assist, it will be once a week. If your voluntary work is administrative, of communication or management, you can come more than once a week, according to your availability and the service need and, in some cases, you can also do online voluntary work. Do I need a specific formation? To do voluntary work at Arrels, there is no necessary a specific formation. It is only necessary if you do administration, communication, computing, etc. voluntary work and the task requires of specific knowledge. I have never done voluntary work, what can I do? Accompany people who live on the streets of Barcelona, along the street team. Spending some time with the people who come to the Open Centre and give a hand with the shower, wardrobe, pharmacy and cloakroom services. Visit homeless people known by Arrels that now live in a residence or that are hospitalized. Do night voluntary work in the Flat Zero of Arrels. Collaborate in the workshop activities. Give a hand with the maintenance of the flats and facilities of Arrels. Collaborate with the communication team in tasks of editorial staff, design, translation or telephone attention (in some cases, you can do online voluntary work). Give a hand to the computing and internal management team of the entity in administrative tasks, helping to repair computing material, collaborating with the company team, etc. Can I do voluntary work with my family? At this moment, we do not consider this option but we do take it into consideration in case, further on, there is a chance to make it a reality. Can I do voluntary work with my company? Yes. To do it you need to contact with the company team of Arrels writing an email to empreses@arrelsfundacio.org. We invite you to know more about it visiting our company website. We are students and we need practical experience, is it possible to do it at Arrels? If you want to do a classwork, every last Wednesday of the month, in the afternoon, we offer informative meetings where we answer the questions to all the interested students. We talk about the issues of homeless people and also about the work at Arrels. You can ask for more information and confirm your attendance writing an email to escoles@arrelsfundacio.org. If you are a university student and you want to do your professional practices at Arrels, you can contact with the human resources team writing an email to personal@arrelsfundacio.org. If you want to come with your school, high school or educative centre to know more about what we do, you can write an email to escoles@arrelsfundacio.org. Voluntary work at Arrels requires a continual commitment over time. To do a small voluntary work that allows you to know the entity, we can offer you the summer voluntary work. You can write an email to voluntariat@arrelsfundacio.org. Do I have to be registered as a member to do voluntary work? You cannot be a volunteer without becoming a member and the other way around. What do I win doing voluntary work at Arrels? It is a win-win: Arrels grows up in human team and you extend your experience in a personal way in front of an experience of a social reality. What are the rights of the voluntary work? Receive information, formation, orientation and support when the voluntary work starts and in a permanent way. Participate actively in the entity. Insurance against any possible accident and illnesses derived directly from the exercise of the voluntary work. Be reimbursed for the costs incurred in the performance of the activities. Do the activity with good security and hygiene conditions. Respect and recognition for the social value of the voluntary work contribution. Which are the commitments of the voluntary work? Fulfill with the acquired commitments with the project you are involved in, respecting the purposes and norms. Do not spread nor publish personal data of users, workers and volunteers you are in touch with while being associated with Arrels. Turn down any material compensation that can receive from the beneficiary or from other people associated with voluntary work action. Respect the rights of the beneficiary people of the voluntary work activity. Act in a diligent and solidarity way. Participate in formative tasks planned by the organisation in a specific way for the confident activities and functions. Follow the proper instructions to the purposes that are imparted to develop the mandated activity. What to do if you see someone on the street? Warn us by Arrels Tracker. If you can not find an answer to all of your questions, ask us!